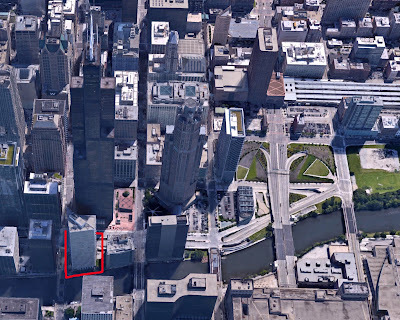 January 22, 1946 –Announcement is made that the entire block bounded by Adams Street on the north, Market Street (which disappeared when Wacker Drive was completed) on the east, Quincy Street on the south, and the Chicago River on the west has been purchased for $525,000 in cash. There are two buildings on the site, one of six stories on Market Street and a ten-story building overlooking the river with an entrance on Adams Street. An interesting combination of sellers signs off on the deal, including the Art Institute of Chicago, the University of Chicago, and the Chicago Natural History museum. The property was formerly owned by steel magnate Martin A. Ryerson, who bequeathed it to the three institutions in his will. The land includes approximately 38,000 square feet and the two buildings have a total floor area of 250,000 square feet. Arthur Rubloff and Company will manage the property. What stands on $525,000 worth of land today? 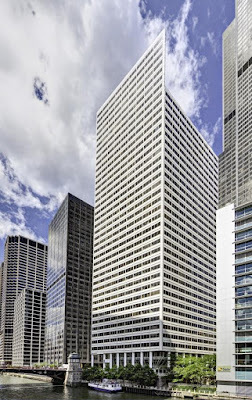 Architect Harry Weese designed 200 South Wacker Drive, which opened in 1981. January 22, 1903 – Chalk one up to “the amazing projects that never got built” department. The Chicago Daily Tribune reports that the South Park Board and the Lincoln Park Board will submit a bill to the legislature authorizing a $2,000,000 bond issue to construct a half-mile subway beneath the river between Michigan Avenue and Pine Street. The south portal will be at Washington Boulevard, and the north end will be situated at Ohio Street. Daniel H. Burnham has already drawn plans for the subway which “is to be elaborately constructed with a view to securing the highest ornamental beauty.” [Chicago Daily Tribune, January 22, 1903] The length of the project will allow the grade to be slight and “in every detail it is proposed to make it free from the ordinary objections to tunnel communication.” Lincoln Park Board President W. W. Tracy says, ‘We believe that the subway project will appeal to the north side people as the only true solution of the communication problem. A viaduct would not offer a satisfactory solution. The proposed subway will be an elaborate and ornamental tunnel, which will not contain any of the objectionable features of ordinary subways.” The subway, of course, was never built, and it would be another 17 years before the bridge spanning the river at Michigan Avenue would be opened. January 22, 1953 – The president of the Federal Reserve Bank, Clifford S. Young, announces that the summer will see the addition of four stories to the 15-story building. The bank at 230 South LaSalle Street holds nine billion dollars in its own assets and 18 billion for the treasury and banks belonging to the federal reserve system. 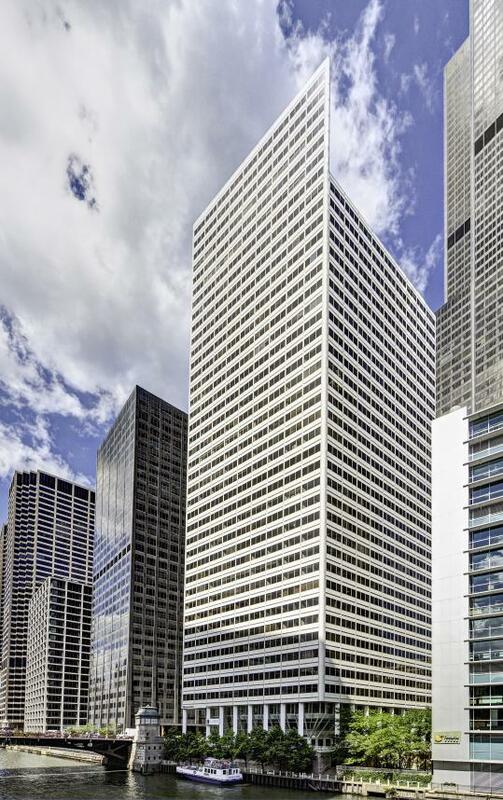 The architects will be Naess and Murphy, the same firm that will design the Prudential building, still two years away, and the Sun-Times building on the river that will be started the year that Prudential finishes. The four floors of the bank on La Salle Street will add 88,000 square feet of space to the building that first opened in 1923. 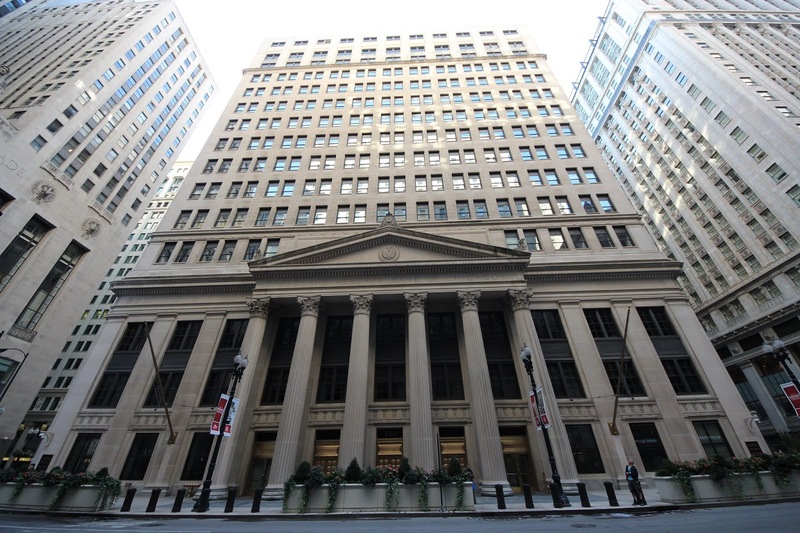 The building will not need any additional foundation work to support the weight of the addition, and that addition will relate aesthetically to the classical design of the building as well as to the Continental Illinois National Bank and Trust Company of Chicago directly across La Salle Street to the east. January 22, 1954 -- The Chicago City Council Finance Committee votes to allocate $950,000 from motor fuel tax funds for construction of a steel viaduct extending Lake Street eastward across Michigan Avenue to Beaubien Court. At that point the viaduct will turn south to Randolph Street, passing along the west side of the Prudential building, which is under construction. A new viaduct might not sound like a big deal, but that piece of infrastructure, along with Prudential, were the first steps in converting the massive railroad yards, extending from the river south to Randolph and from Michigan Avenue to the lake, into what is today's Illinois Center. 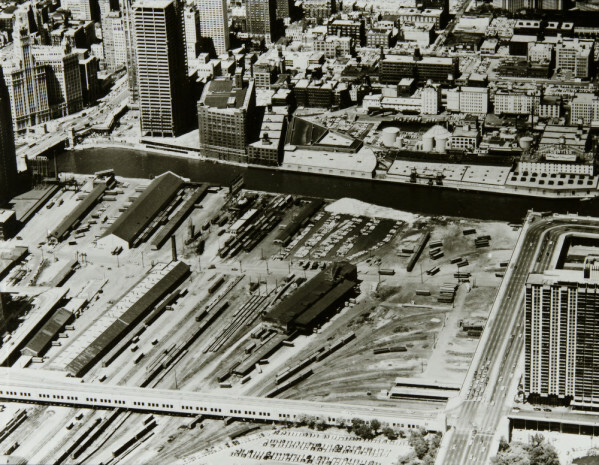 The grainy photo above, taken over ten years later, shows a portion of the viaduct, the "L" shaped roadway in the lower left corner of the photo. Randolph Street is the long horizontal roadway at the bottom of the picture with the river winding through the photo's middle. Just below the river, where the second long train shed from the left stands, is the location of today's Hyatt Regency Chicago on Wacker Drive.